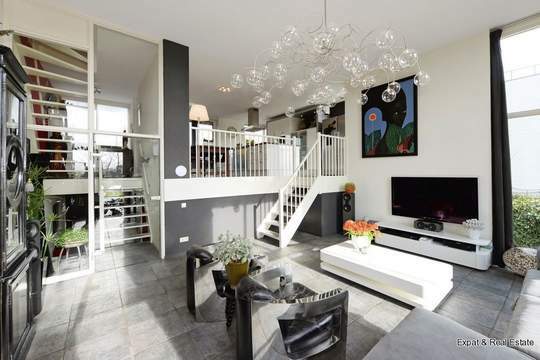 REALLY FANTASTIC LUXURY double upstairs apartment of no less than 230 m2. The apartment is very well maintained, equipped with a luxury kitchen with all appliances, 2 luxurious bathrooms fully equiped! There is also a beautiful parquet floor. There are 3 bedrooms. Location: RIGHT IN THE HART OF THE CITY where all shops for the daily needs are literally around the corner. Also just around the corner you find cosy terraces, restaurants and Pathe cinema. very luxury shared entrance with calltableau and mailboxes. main entrance with stairs to the 2nd floor. beautiful generous hallway, spacious bright living room with fireplace, cozy living-kitchen with all appliances. Sleep/work room. Separate toilet with sink, very spacious laundry equipped with washing machine and dryer. The beautiful staircase will take you to the 3rd floor. Here again a generous hallway, 2 very large bedrooms, separate toilet with sink. And 2 very luxurious bathrooms. Bathroom 1 has a double washing table, large walk-in shower, separate steam room and design radiator. Bathroom 2 has a double washing table, walk in shower, bathtub and design radiator.